Once your system has completed loading the boot media, a boot menu is displayed using GRUB2 (GRand Unified Bootloader, version 2). The boot menu provides several options in addition to launching the installation program. If no key is pressed within 60 seconds, the default boot option (the one highlighted in white) will be run. To choose the default, either wait for the timer to run out or press Enter. To select a different option than the default, use the arrow keys on your keyboard, and press Enter when the correct option is highlighted. On BIOS-based systems, the preferred way is to press the Tab key and add custom boot options to the command line. You can also access the boot: prompt by pressing the Esc key but no required boot options will be preset in it. In that case, you must always specify the linux option before using any other boot options. On UEFI-based systems, press the e key and add custom boot options to the command line. When ready press Ctrl+X to boot the modified option. See Chapter 22, Boot Options for more information about additional boot options. Choose this option to install Red Hat Enterprise Linux onto your computer system using the graphical installation program. This option is the default. Prior to starting the installation program, a utility is launched to check the integrity of the installation media. This item is a separate menu containing options that help resolve various installation issues. When highlighted, press Enter to display its contents. This option allows you to install Red Hat Enterprise Linux in graphical mode even if the installation program is unable to load the correct driver for your video card. If your screen appears distorted or goes blank when using the Install Red Hat Enterprise Linux 7.0 option, restart your computer and try this option instead. 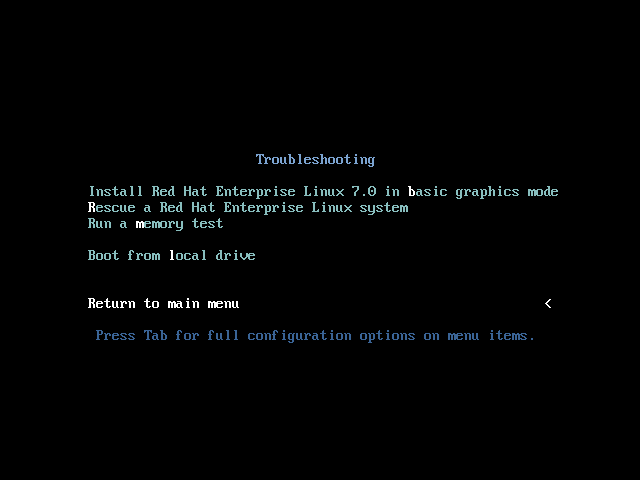 Choose this option to repair a problem with your installed Red Hat Enterprise Linux system that prevents you from booting normally. The rescue environment contains utility programs that allow you fix a wide variety of these problems. This option runs a memory test on your system. For more information, see Section 22.2.1, “Loading the Memory (RAM) Testing Mode”. This option boots the system from the first installed disk. If you booted this disc accidentally, use this option to boot from the hard disk immediately without starting the installation program.